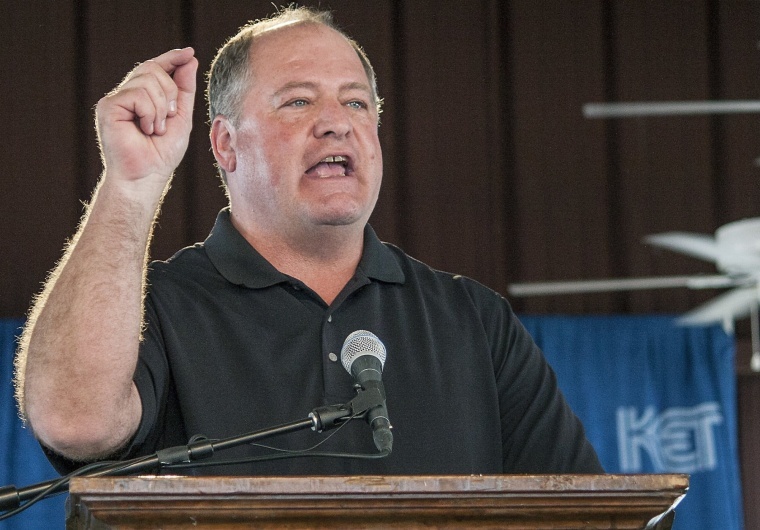 FRANKFORT, Ky. — Kentucky's House Republicans will meet privately Friday to discuss the future of House Speaker Jeff Hoover after the state's largest newspaper reported the GOP leader settled a sexual harassment claim by a member of his staff outside of court. The Courier-Journal reported those allegations Thursday evening based on anonymous sources. The Associated Press has not been able to confirm those details. A spokesman for Hoover did not return calls seeking comment. Others with knowledge of the incident also declined to comment. Republican Party of Kentucky spokesman Tres Watson condemned "sexual harassment in any form," but criticized the story as "based on nothing more than anonymous sources and third hand copies of text messages." But the unconfirmed reports threaten to upend the party's legislative agenda. The revelation comes as Hoover is trying to muster enough votes in the Republican-controlled House of Representatives to pass a bill that would make substantial changes to the state's public pension system, one of the worst-funded retirement plans in the country. The bill is a priority of Republican Gov. Matt Bevin, who has vowed to call a special legislative session by the end of the year to vote on it. The bill is unpopular with state workers and public school teachers, who have filled town hall meetings with lawmakers across the state to object to a proposal that would eventually shut down the pension system in favor of a 401(k)-style plan. Some Republican lawmakers wondered if Hoover could keep his job, given the allegations. "It calls everything into question. And two days ago, it wasn't," Republican Rep. Phil Moffett said. "We have some incredibly difficult things we have to do for the state. Pension reform, tax reform, a budget; all three of those are three ring circuses on their own. And then layering this on top makes it all the more difficult. We have to get through this quickly. I believe that is the biggest reason we have to address it (Friday)." Democrats did not call for Hoover's resignation. House Democratic Leader Rocky Adkins declined to comment on the allegations, but added "the General Assembly has a zero-tolerance policy when it comes to any form of harassment." All state lawmakers have had to attend annual sexual harassment training since 2013, when three female staffers filed sexual harassment lawsuits against several Democratic lawmakers that led to the resignation of former Rep. John Arnold. The Legislative Research Commission eventually agreed to a $400,000 settlement with the women. Republican state Rep. Jerry Miller said it was crucial for lawmakers to remain focused on passing the pension bill. Kentucky is at least $33 billion short of the money required to pay retirement benefits over the next 30 years, and state Budget Director John Chilton warned lawmakers Thursday that they would have to find at least another $1 billion to spend on the pension system unless changes are made. Pressed on whether the House could pass the bill with Hoover as speaker, Miller said "I can't answer that." "It can't be understated how important this bill is," he said. "I recognize it has problems that will jeopardize its passage in the House and I'm going to work hard to make sure that we get this bill passed." Hoover has been in the House of Representatives for 27 years, toiling for much of that time in the Republican minority. He was the minority leader for 16 years before being chosen speaker in January after voters elected a Republican majority in the House for the first time in nearly 100 years. As speaker, he pushed through legislation that restricted abortion, limited the power of labor unions and allowed for the creation of charter schools. He is married and has three children. Some Republican lawmakers said Thursday they were reserving judgment until they heard from Hoover himself. "We're going to have to have a conversation," said Rep. Richard Heath of western Kentucky, adding that he thinks Hoover can still lead the House because of his experience and institutional knowledge. Wesley Morgan, one of the wave of new Republican members elected in 2016, called it "a pretty serious charge" but said he doesn't believe it because Hoover's "character is beyond reproach." Republican Senate President Robert Stivers said he has not spoken to Hoover or any other member of House leadership about the allegations. He said he is sure the allegations will have an impact on the pension bill, but said "I just can't gauge it."